What happens if U.S. debt gets downgraded? The National Association of Realtors®, on behalf of its 1.1 million members, their clients and customers, and the nation’s 75 million homeowners, urges Congress to resolve the mounting debt ceiling crisis before the August 2 deadline. Until a resolution is reached, Congress will be unable to address the myriad issues facing the nation’s families, communities, and economy. The indecision in Congress is paralyzing progress on other fronts, and it is harming home buyer confidence and negatively affecting home sales. Just to make a point that could be overlooked in the confusing discussion about the effects of default on financial markets: It’s true that nobody really knows what effect failure to make full payment on the debt will have. It could produce calamity, or it could be contained, with borrowing rates for the private sector barely affected. But what we do know is that if the government is forced to slash spending when the money runs out — if it stops sending out Social Security checks, or stops paying vendors, or whatever — this will have a huge negative impact on the economy. We’ll be doing a 1937 squared. And yes, it will hurt the Washington, DC metro area. Forecasters expected sales of existing homes to rise in June because the pending home sales index, which measures signed contracts, rose in May. 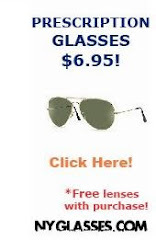 If you consider it takes 1-2 months to close, then there's your indicator. What Realtors and prognosticators did not even consider was a strange phenomenon: June saw a spike in the contract cancellation rate to 16 percent. Existing home cancellation rates usually run under ten percent, and, in fact, in May were at just 4 percent. Cancellation rates for new home construction usually run higher than that, as buyers of newly built homes tend to be more volatile and put less (often nothing) down when signing a contract. "I think it's the broader, very slow economic activity," said Lawrence Yun, the National Association of Realtors' chief economist, who earlier told a room full of reporters that he was still trying to find the source of the spike. "The economy is expanding at a very slow pace, job creation is very slow, the consumer confidence has certainly taken hit in the second quarter, so there could have been some buyers who had some second thoughts and just decided to pull out of the contract, but at the moment it's still unclear as to why there was a measurable rise in cancellations." To get the banks to approve low bids, appraisals or broker price opinions are manipulated. ... Sometimes, said Hagberg, fraudsters bribe appraisers or brokers to get the prices they want but they can employ sneakier methods as well. ... Sometimes an agent will point out every defect in the home to get appraisers to reduce their values, according to Hagberg. The impact of short sale fraud goes well beyond the direct losses to banks. These frauds have become so common, it has become more difficult for legitimate short-sale transactions to go through. That hurts sellers because it forces more of them into foreclosure. Just one more reason not to trust Realtors®. A couple of recent conversations have convinced me that many people have "bubble illusion." When they talk about how much they have lost on their houses and in the stock market, and how that has affected their feelings of economic certainty, etc., the losses are almost always expressed relative to the peak bubble value rather than to a realistic assessment of what the house or stock was actually worth during the bubble years. It does seem to me that whenever asset values are below their peak, people compare them to the peak. When the peak was a bubble, they're not thinking rationally. The Obama administration has announced yet another initiative to help struggling homeowners avoid foreclosure. Earlier this week, the Department of Housing and Urban Development announced it would extend the period of time unemployed homeowners with Federal Housing Authority-backed mortgages could skip or make smaller mortgage payments to a minimum of 12 months, up from a minimum of four. The extension should help solve a persistent problem with FHA's existing forbearance program: Even though servicers of FHA-insured loans were able to offer borrowers longer grace periods before, most opted to limit offers to the minimum period of four months, an inadequate timeframe, according to HUD Secretary Shaun Donovan. "Providing the option for a year of forbearance will give struggling homeowners a substantially greater chance of finding employment before they lose their home," he said. Under the program, borrowers are expected to make up the skipped payments once they return to work. I don't mind this plan nearly as much as Obama's earlier plans, because this plan focuses only on people who are actually unemployed. Most previous plans were designed to help people whose hopes of getting rich quick through real estate didn't pan out. Most previous plans focused on the value of the house, rather than the employment status of the homeowner. It sounds like homeowners under the plan will have higher mortgage payments after they return to work than before they lost their jobs. Although it's better than having to pay a mortgage when unemployed, homeowners may still have a financial burden that is too difficult to handle. Thus, they may still end up losing their homes. The utter unfairness that homeowners are still treated better than renters by the government. A homeowner who loses his job gets to stop paying his mortgage, but a renter who loses his job still has to pay his rent. America's poor are much more likely to be renters than homeowners, so this is a regressive plan. Click on the map to see the full-size version. Each circle represents a zip code. 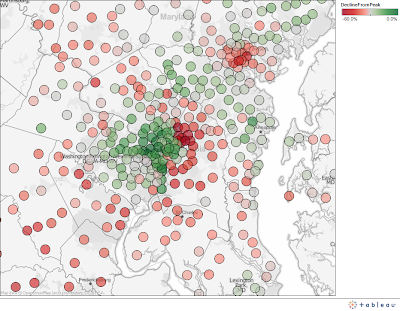 Red circles show places that fell more than the DC metro area average since the peak. 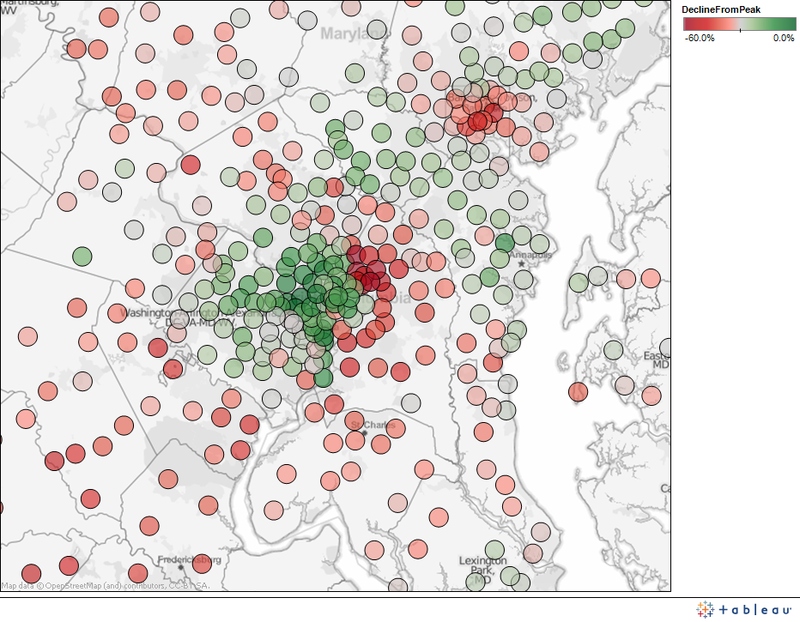 Green circles show places that fell less than the DC metro area average.